The Ceramill Mikro is an extremely robust and compact 4-axis milling machine for dry milling blanks and single blocks of zirconia, wax, hybrid-ceramic or dry-millable composite materials. 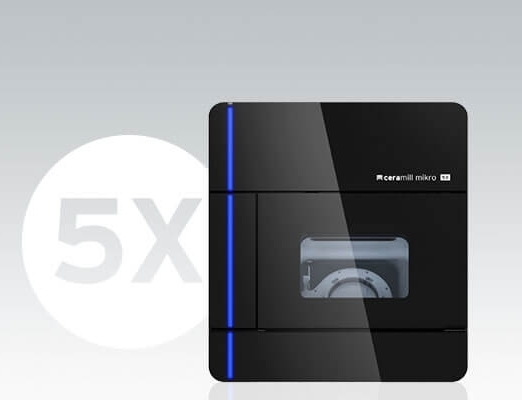 Equipped with high performance components for lasting stability, economicalness and precision, yet requiring only a minimum financial investment, the Ceramill Mikro provides laboratories with an easy start to in-house CAD/CAM or optimises efficiency and productivity in routine everyday lab procedures. Covering the full range of classic laboratory in-house fabrication indications, including, thanks to Ceramill Sintron sinter metal, non-precious frameworks, Ceramill Mikro smooths the way toward full in-house value creation, cost-effectiveness and precision-fit, quality frameworks without the need for preparatory work or reworking.